Vinyl Playback at it's Best! Play / transfer vintage records that won't play on any other tunrtable, or play regular music at 1/2 (or even double) of the speed for music practissing purposes.  I provide fully refurbished custom modified tunrtables to your order and specifications, or the modification of your already exisitng tunrtable.  I can provide other speacial customization featues to order, such as reverse play direction, wiring for vertically or latherally cut mono records in addidtion to regular stereo, or selective switching capabilities for the above. I also provide custom head shells, Parts and Accessories, and more. 1) A direct drive turntable in perefect working condition* providing a 1/2" standard-mount headshell to mount 1/2" standard mount cartridges. A cartridge that provides the needed wide groove stylus for 78's, OR: A dedicated head-shell / cartridge, that provides the 78 RPM wide groove stylus. AKAI AP-D2, AKAI AP-D33, Dual CS-621, JVC L-F41, MCS 6700, MCS 6601, Pioneer PL-4, PL-200, Pioneer PL-400 (Quartz Lock DD), PL-450, PL-600, Realistic LAB-390, LAB-420, Realistic LAB-500, Sansui SR-525, Sansui FR-D3, SCOTT PS-60, SONY PS-T22, PS-X40, SONY PS-LX2, Technics SL-BD22 (Belt Drive - modification to add 16 RPM only! ), Technics SL-D2, Technics SL-D3, Technics SL-1300 , Technics SL-1400, Technics SL-1800, SL-1800, SL-1900, Technics SL-3200, Toshiba SR-A200. If your turntable model is not listed above: Please tell me what make and model, if direct drive (belt drive turntable modifications to 78 RPM not recommneded, and often no speed modification possible at all - need ot know motor type), If the turntable provides mounting for a standard-mount 1/2" cartridge. For turntable models not listed above I will give a first response by e-mail, and if we determine, that your tutntable model is a likely candidate for possible modification you will have to ship it in. After an extensive equipment evaluation I will tell you what I can do for you, how long it will take, and how much it will be, or if the unit cannot be modified. If your unit cannot be modified, or if no work is ordered, I charge a flat $50 equipment evalauation fee and will return the tunrtable in the same working condition, or better, in which it was shipped in. (Likely I will perform basic maintenance and re-work to improve long term reliablity of your unit, in order to get reliable test results form your unit) Shipping costs in addition.  Most tunrtables are limited to play standard up to 12" records. Speed modification to 16 RPM will provide 16 RPM platter speed for regular record sizes up to 12", but cannot address size requirments for 16" disk size, such as used for commercial broadcast and trascripton records. In most cases: for 16" disks a specialty tunrtable will be needed - Please Inquire. Technics 4 Speed Direct Drive Turntable Custom modified to play 78 and 16 RPM records, or regular LP music at half of the speed for music practicing purposes in addition to 33 and 45.  4 speeds: 16 and 78 in addition to the regular 33 and 45 RPM.  Ready to play any record up to 12" including 78's - Plug and play!  An excellent turntable for the money! Description: This Technics high qyuality direct drive turntable is a fine precision instrument that provides reliable and studio quality perforance. A very nice quality turntable that I custom modified, now to provide 4 speed (16 and 78 RPM in addition to 33. 45) It features pitch control fine adjustments and stroboscope speed monitoring. It comes with both the needed wide groove 3 mil stylus for 78 RPM and the 1 mil LP stylus. Both stylie are new and cartridge mounted in this turtnable is a vintage quality Shure cartridge. Work performed: Mechanically sound. Electronically overhauled before the unit was modified: re-soldered aged solder points for reliably operation for decades to come, re-worked trimmers, controls and switches; replaced aged capacitors and upgraded some capacitors with custom matched parts, custom modification to accommodate 78 and 16 RPM speeds in addition to 33, 45. Condition: Physical condition: Excellent (9/10), The usual signs of use, such as fine scratches - The unit looks nice (actual unit shown) and lappears clean - will be glad to provide higher resolution detail images, if needed. Lot: 1 custom modified Technics SL-3200 direct drive turntable with vintage Shure cartridge, new stylie for LP(1 Mil) and 78 (3 Mil) - ready to play all record types up to 12" and 78's (change stylus for 78 RPM). Also included: paper stroboscope disc for calibration of 78 RPM. Includes dust cover - Custom modified to 4 speed + Refurbished! With your inquiry please indicate which of above options will be needed (if any). Price: $ 425 + Options elected SOLD!  16 RPM allows to play regular LPs at half speed! 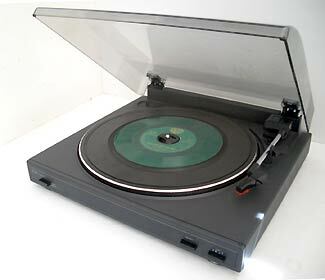 Description: This is the lowest possible price for a 4 Speed automatic turntable with magnetic cartridge. Get a magnetic cartridge (over ceramic) for better sound. 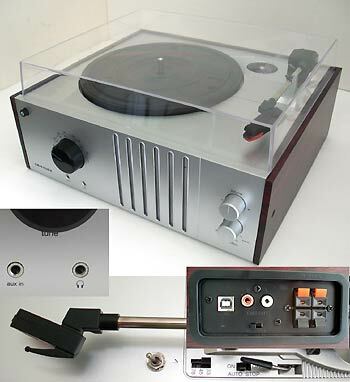 This turntable features: Direct USB hook-up for computer recording, but also provides line level and phono outputs (switchable) for hook-up to a stereo system. There are design flaws with this model: The tone arm is made cheaply and has too much tracking force, and the unit does not serve 10" records automatically (play them manually!) but hey, it works and makes pretty good sound recordings! I have sucessfully recorded 78's and 16 RPM voice records to test it and it turned out good. This 4 speed turtnable is perfect for transfering "I AM" 16 RPM records and 78's, but handles LPs and singles as well. Condition: First repaired then custom modified for 4 speed. Works flawlessly. Was new, store return, but blemishes: finer scatches and blemishes. I can send higher resolution images, if needed. Lot: 1 Audio Technica model: LP60-USB custom modified 4 speed USB Turntable (as shown in above picture - ready to ship), w/ dust cover, 45 singles adapter, Original Recording Software CD, platter mat, original owners manual, original box , new USB cable, new stylus for regular LP mircogroove records, such as LPs and singles (16/33/45 RPM) IF a 78 rpm stylus - is needed, see options below. Price: $ 255.00 near mint (but with blemisehs).  Stand-Alone listening - has built-in speaker! Condition: Was new, store return. slight belmishes. First repaired then custom modified for 4 speed (this took more than $275 in labor!) I also eliminted a problem: there was acousticasl feed back form spekaer to phono cartridge. Lot: 1 Crosley CR-6017B-MA custom modified USB Turntable / Record Player (as shown in above picture), w/ dust cover, 45 singles adapter, original unopened Recording Software CD, USB cable, platter mat, AC power supply (117V Ac to 9V DC), original unopened owners manual, original box and packing materilas, stylus for regular mircogroove records, such as LPs and singles (16/33/45 RPM) IF a 78 rpm stylus - is needed, see options below. The time to modify this turntable exceeeds my asking price by far, but offered here to help one of you out, who is on a tight budget! With your inquiry please indicate which of the stylus options below will be needed (if any). Custom modified to play 16 and 78 RPM records (only). Play regular LP music at half of the speed for music practicing purposes, or for 16 RPM specialty records up to 12". Description: As many of you indicated the need for a modern turntable that plays 16 RPM + 78 RPM at the lowest budget possible, here now a turntable to provide a 16 + 78 RPM at the lowest cost possible. A basic stereo tunrtable made in the'90s, custom modified to provide 16 and 78 RPM. Manual play with Auto-return at a very reasonable and attractive price! Condition: Used. Mechanically sound. Completely overhauled (new belt) and cleaned, modified to provide 16 + 78 RPM speeds. Cosmetics: Good (8/10), some signs of use, some (fine) scratches on the dust cover and body. Front panel wrinkeled. Overall appearance: Nice! Actual unit shown in above image. I will be glad to e-mail high resolution images. I AM Student Special Price: $ 99.00 + Add-on Options elected (if any). Listen to, or transfer your 16 RPM I AM records with this turntable at a low budget. OR: use below Quick Check Out Shopping cart button to purchase this unit without any additional options. The cart will bill you a total about $125 total ($99 + about $26=Shipping DEPOSIT). Payment processed through PAYPAL. With Payment I will: pack, then calculate actual shipping cost to your ZIP code (within continental USA only! ), refund the shipping cost over payment (if any), SHIP and e-mail tracking number. Restrictions apply - so: I may cancel this purchase and refund. If need to approve shipping costs, before I ship, please use: Buy/Inquire instead. Please READ and agree to All details before proceding here. 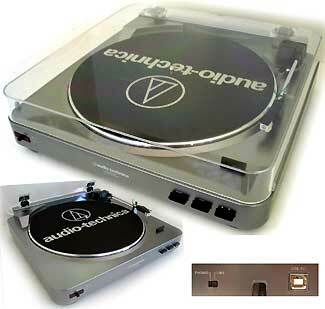  Inquire about other custom made multi speed turntables - I will build it for you! Custom modified to play 16 and 33 RPM records (only). Play regular LP music at half of the speed for music practicing purposes, or for 16 RPM specialty records up to 12". Description: As many of you indicated the need for a modern turntable that plays 16 RPM with the best sound quality on a limited budget, here now a turntable - my objective for this turntable was to provide a 16 RPM turtnable at the lowest cost possible. 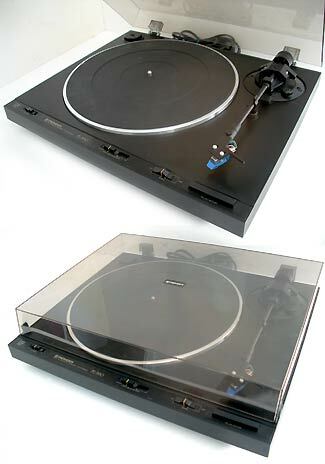 A basic quality Hi-Fi stereo tunrtable made in the'90s, custom modified to provide 16 and 33 RPM. Automatic, Auto-return or manual play at a very reasonable and attractive price! Condition: Used. Mechanically sound. Completely overhauled and cleaned, new stylus, modified to provide 16 + 33 RPM speeds. Cosmetics: Good (8/10), some signs of use, some (fine) scratches on the dust cover and body. Front panel wrinkeled. Overall appearance: Nice! Actual unit shown in above image. I will be glad to e-mail high resolution images. Lot: 1 Pioneer custom modified turn Table (as shown in above picture), has new stylus installed and includes 7" Singles Center Puck. Note: ADC magnetic cartridge with new stylus works well for regular mircogroove records only, such as LPs and singles (16 / 33 / 45 RPM) If turntable modified for 78 RPM (see "add-on's" below): a different cartridge will need to be installed, as a 78 RPM stylus will be needed. I AM Student Special Price: $ 125.00 + Add -on Options elected. 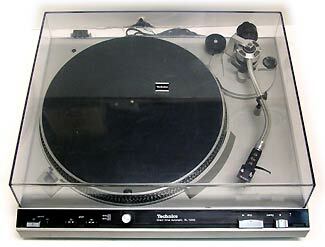 Listen to or transfer your I AM records with this quality turntable for great sound. 3A) Further modify this turntable: Modify to 4 speed (16 / 78 / 33 /45 RPM) and replace cartridge with one, for which a 78 RPM stylus is available. This requires physical modification of the player to accomodate a 4 position switch, plus to add the extra needed circuitry. Add $150 - 78 RPM Stylus extra. Likely this modification will take me more than $150 in labor, but I will bill only $150. 3B) Modify the speed selection of this turntable (will remain 2 speed): 16 RPM + Modify to replace the 33 RPM with 78 and replace cartridge with one for which 78 RPM stylie are available. Add $90 for 78 RPM OR: Modify 33 for 45 RPM. Add $50 for 45 RPM (ADC cartridge remains - will not be changed). OR: use below Quick Check Out Shopping cart button to purchase this unit without any additional options. The cart will bill you a total about $185 total ($125 + about $60=Shipping DEPOSIT). Payment processed through PAYPAL. With Payment I will: pack, then calculate actual shipping cost to your ZIP code (within continental USA only! ), refund the shipping cost over payment (if any), SHIP and e-mail tracking number. Restrictions apply - so: I may cancel this purchase and refund. If need to approve shipping costs, before I ship, please use: Buy/Inquire instead. Please READ and agree to All details before proceding here. $135, or $125 with turn table purchase.